07 August 1981, the animated movie Heavy Metal opened in theatres. My favorite part is the scene called "Taarna". I think every graphic artist who has dabbled in fantasy artwork since then has drawn their own version of a female warrior riding some type of winged beast. I won't pretend to be any different. This is my try at it. I made the longhaired, golden-lance-wielding amazon ride a rather large dragon. The dragon's eyes continue to amaze me to this day. I am not sure how successful I was in having the rider appear surprised but I hope the position of her hands, combined with a stunned facial expression, help to achieve that effect. 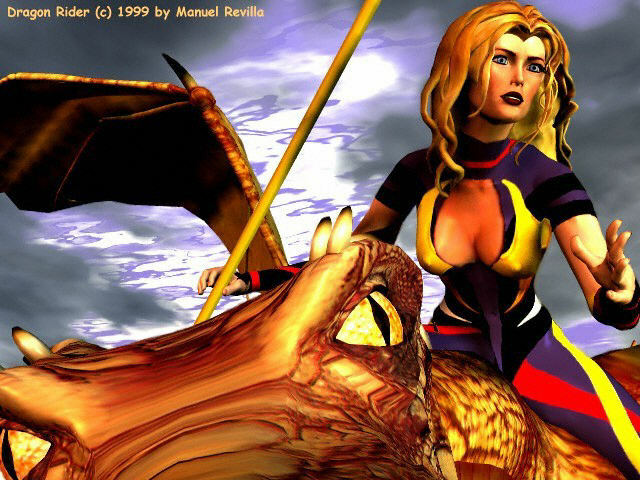 Dragon Rider is copyright 1999 by Manuel Revilla, all rights reserved.